Orono Public Library Foundation officials received the final installment on a $15,000 matching gift from The First for Chapter Two: The Campaign for the Orono Village Green. The First matched new gifts to the campaign dollar-for-dollar, up to $15,000. Their gift will be used to name the holiday tree on the Orono Village Green. “We are deep ly grateful to The First for their generous matching support ,” Foundation President and Campaign Co-Chair Sarah Kenney said. “Their generosity, along with hundreds of other donors, has made the Orono Village Green a reality,” Kenney added. Work began on the Orono Village Green site directly behind the library earlier in June. Sargent Corporation of Stillwater, ME is the contractor. The Orono Village Green will feature a 125-seat amphitheater and stage, lawn and granite seating, hundreds of ornamental trees, flowers and plantings, a stone plaza with tables, chairs and sun shade, an overlook area, pergola and bench seating areas. There will also be pathways circling the grounds connecting to the Orono Senior Center and leading to the village. 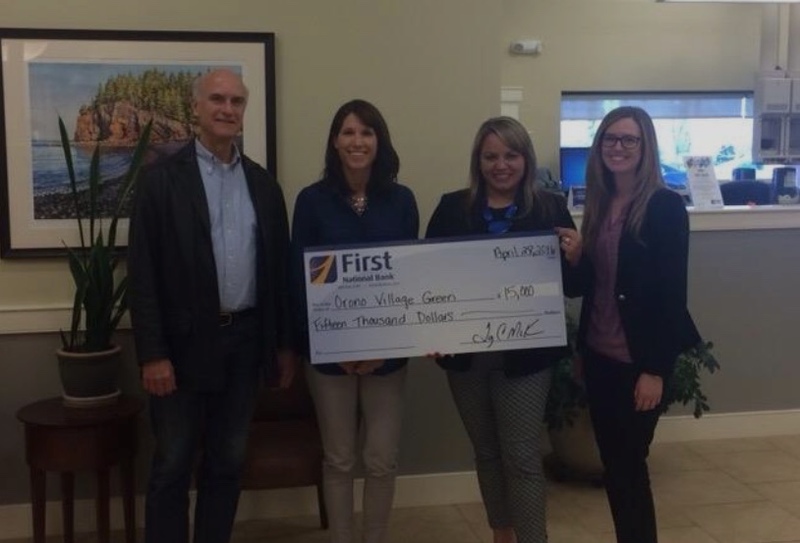 Funds for the Orono Village Green campaign were raised privately and have been gifted to the Town of Orono. The library and grounds are property of the town, and all aspects of the construction project are being managed by town staff. 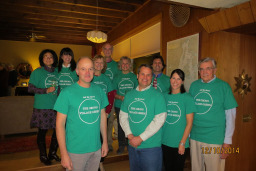 Contributions were received from 375 donors to the Orono Village Green campaign. The First has been serving the financial needs of Maine people since 1864, with banking and investment management offices in 15 communities along the coast and in Bangor. For more information about The First, please call 1-800-564-3195 or visit www.thefirst.com . Gathered in the Bangor office of The First to present their matching gift to the Orono Village Green campaign: (Left to right) Geoff Gordon, Foundation Treasurer, Sarah Kenney, Foundation President and Campaign Co-Chair; Courtney Brehaut, The First Vice President, Regional Manager for Bangor and Hancock County offices; and Kristen McAlpine, Branch Manager of the Bangor office.